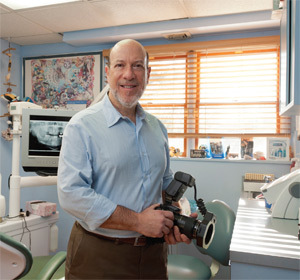 Dr. Edward Zuckerberg, a New York practicing dentist is romanced by technology. Herein, we visit his practice and learn that social media runs in the family (yes, he’s the father of the father of Facebook, Mark Zuckerberg). Zuckerberg: The office is about 1,400 square feet. The office is attached to my home in the New York City northern suburb of Dobbs Ferry. The patients enter through a separate wing of the house into an open reception area, sharing a common room with the reception desk where we have two front desk personnel with computers. There are two business areas just off the reception area. One has a desk for our insurance and data entry employee and the other belongs to our office manager but also has a digital panoramic Xray and the milling machine for our E4D CAD/CAM. We actually added this room to the office about five years ago. We have three treatment operatories and a lab/sterilization center (used to be our darkroom but we’ve been darkroom-free for 13- plus years now). Adjacent to the office is the media room, used primarily for family TV watching, but I have hosted professional presentations here for Henry Schein and Imageworks. We purchased the house from a retiring dentist in 1981, more than 30 years ago, but the practice was housed in a one-chair setup. We renovated the house and added a 1,200-square-foot, two-story addition in 1987 that brought it to the current state. The window bay from the old house is now the wall between the two new operatories and contains a custom built-in 200-gallon saltwater aquarium that is viewable from both operatories and is see-through. I have a full-time associate, so the office is covered on days I’m not there. What is the hardest part about living in the same house as your dental practice? Zuckerberg: This has been overwhelmingly positive for me to have my office in the house. It has allowed me and my wife, Karen, to be both professionals and dedicated parents to our four children. I got used to being the only Dad present at events like open class day and second grade school plays because it was easy for me to block out an hour to run to our local school and quickly return. People warned me I’d have patients knocking on my door on Sundays and all hours with emergencies but that never happened. When true emergencies presented themselves, being able to just go downstairs to handle them couldn’t have made dealing with them any easier. The hardest part about it is that you need to have a decent memory and recall of patients’ names because you repeatedly run into them in the supermarket, church/synagogue, restaurants, etc. You need to be on your toes to reinforce that you care about them as people, not just clients/patients. Did your children ever work in your practice during the summer? Zuckerberg: I had them do some filing back in the days when we had paper charts, answer the phones and do simple deeds like make sure that lab cases got picked up and delivered. My son, Mark, actually made our office a computerbased communication system called Zucknet that removed the need for a Comlite type system of inter-operatory and front desk communication. Your office has a distinct fish theme with a large aquarium as a focal point. What advice do you have for other dentists contemplating a similar feature? Zuckerberg: Choose a reputable firm that has been in business for a while and get recommendations from satisfied customers. Have the tank serviced regularly by a professional to keep it attractive and running smoothly. I put mine in the operatory since I spend most of my time there and want to enjoy it too. That’s also where the patients need it because the operatory is where they are most stressed. Putting it in the waiting room sends the message to patients that they are going to spend a lot of time there and I want my patients waiting as little as possible. Your Web site says you “cater to cowards.” What inspired this focus? Zuckerberg: I don’t think there is anything in dentistry that I find more rewarding than taking people who haven’t been to the dentist for 10 or more years, who have finally forced themselves into the office practically in tears because of the pain and then being able to convert them into patients who come back for regular care. It is very professionally rewarding to be able to help people that way. This became the focus early on in my practice. 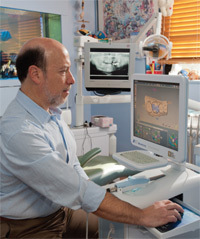 Your practice is full of the latest technology. What are some of the greatest technologies in dentistry right now? Zuckerberg: Everything feeds off computers. I am known as Inspector Gadget by my patients. When I saw the availability of digital X-rays in the late ’90s, I pounced on that technology. 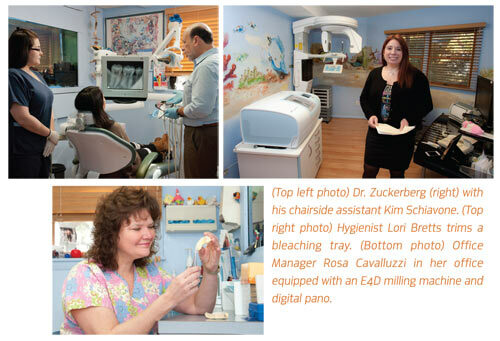 Don’t take intra-oral photography or digital X-rays away from me! I am really learning to love the CAD/CAM. The technology I love and use the most is that which allows us to be a paperless office. I can access my data from every operatory, or even while traveling. Being paperless is probably the technology that I’m most proud of. You use E4D. How long have you been using it in your practice and what materials do you like to mill with it? Zuckerberg: I have been using E4D since 2009. We have done some veneers but mostly I find it has really enabled me to do much higher quality dentistry. Also it’s an option for patients with large composites. Primarily I have been using the lithiumdisilicate, the e.max for real bruxers and my bread and butter go-to is the Empress CAD. It is very easy to work with and doesn’t require glazing. We have been doing fewer crowns and many more onlays. That is the newest in a long line of technologies. Let’s talk about social media. You are very involved with that. How so? Zuckerberg: I lecture several times a year to dentists about technology and social media marketing. Many are afraid to incorporate it into their offices. They are afraid to use a vehicle like Facebook to market their practices. I am trying to educate them. I use all kinds of social media outlets in my practice. With something like Facebook, is it a mechanism for a practice to communicate with its existing patient base or to expect new patients? Zuckerberg: When a practice first starts out, Facebook must be used solely as a vehicle to enhance communication in the office itself. Just by virtue of having a simple sign up in the waiting room, a lot of patients will become fans of your Facebook page. There are a variety of tools to get people to “like” your page. The first tool is a sign in the office where you display your logo and web address. I have my office Web site and my Facebook address on everything. Another thing we do is encourage visitors to check in on their smart phones. If someone walks through the door, he will see a big yellow decal that says check in on Facebook and get a special deal. If he checks in three times at the location, which publicizes to all his network friends that he just checked into Edward J. Zuckerberg, DDS’s dental office, he will walk away with a free take-home bleaching kit. Then I try to get worthwhile messages to Facebook fans. I don’t bombard them. I shoot for two or three updates a week. The key advertising demographic feature on Facebook allows you to market to friends of your fans. This puts a thumbs-up “Like” logo with the name of their friend who already likes your page. If a prospective recipient gets this ad and sees that a friend of his or hers already likes your office, this is a powerful message. We all know word-of-mouth referrals are the best kind of referrals because the new patient comes with implicit trust. Your son Mark’s accomplishments have been well documented. What has been your greatest moment celebrating his accomplishments? Zuckerberg: Firstly, I’d like to say that I am extremely proud of all four of my children and each one of them have not only accomplished great things in my eyes, but I look forward to more wonderful things from them in the future. Almost every year Facebook hosts a conference called f8 that usually features a rollout of a new feature or service it is offering. The conferences are well attended by more than a thousand people. The people in the auditorium listen to every word Mark says and they applaud like Congress does during the President’s State of the Union Address. That’s always a huge thrill for me, but also whenever I hear personal stories from people who met and are now together as a couple because of Facebook or stories of citizens of a country using Facebook to affect meaningful change, those are the times I really feel the full impact of his accomplishments. I noticed on your site you have a link to join Tumblr. Tell me a little bit about Tumblr. Zuckerberg: My youngest daughter, Arielle, created my practice Tumblr using a lot of the same content I already had on my site. Most people use Tumblr as a blogging page but it is a reasonable way for people to create a Web site, which is very easy to post updates to. And the updates I do automatically go to Facebook and Twitter also. It kind of simplifies my job of updating all my electronic presences. Every dentist has patients who make comments about how much money the dentist makes. What is your favorite response to this comment? Zuckerberg: I live in the same community as my patients and drive the same kind of cars that they do, so when patients say I charge a lot (they will do that no matter how much I charge) or say something like, “I’m paying for your next vacation,” I tell them what they are paying for is all my insurance, overhead and salaries for my great staff that takes wonderful care of them. I don’t live a flamboyant life, although in the past 10 months since my first grandchild was born, I travel a lot to California to see him and my patients know I’m gone a lot, but when I tell them it’s to see my grandchild, it’s something they can relate to. Many are concerned that because of Mark’s success I don’t need money and will retire soon. I tell them I still love dentistry and now in addition to practicing I am enjoying passing on my knowledge via lectures to my colleagues on how best to evaluate and integrate technology into their practices and why and how they should be using social media to market their practices. Do you consider yourself a person who loves to work, and will do so into semi-retirement, or will you pick a day, and just stop working? Zuckerberg: I’d like to keep working as long as I’m physically able. I’d love to continue serving the patients in the practice where I have worked for the last 31 years, but realistically the challenges of managing a practice from 3,000 miles away, even with a great staff are at times overwhelming. I’m searching now for the right person who can step in as my successor to the practice, handle most of the management duties in addition to serving the patients as a provider and allow me to serve the patient base part time without the management headaches. I think I’d also like to work with select offices on a one-to-one basis to bring them up to snuff in this great technological environment we live in. What are your thoughts on dentists using Groupon? Zuckerberg: A lot of people only buy products or services they already use. That said, it would be the worst-case scenario if someone who would likely be a full price buyer of your service was to have the ability to purchase the service – which he or she would purchase anyway – at a discount. This is not the kind of marketing that works in the dental office setting. The New York State Dental Association is looking at this from a legal point of view. There is some potential violation of the dental practice act since we are not paying up front for the advertising, but the payment is based strictly on the referral. 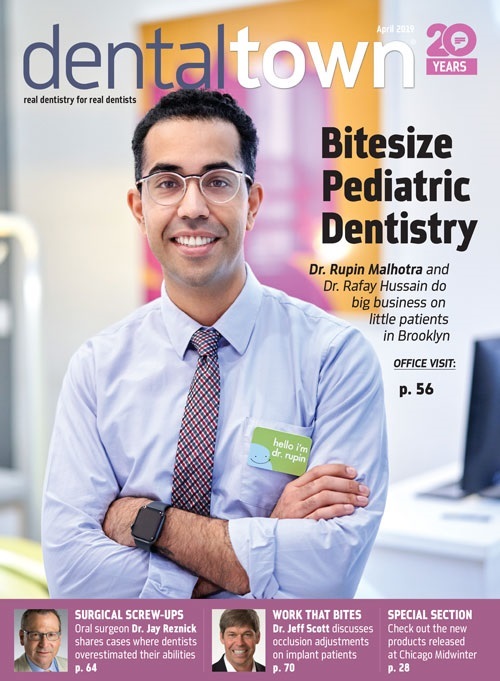 To pay for this type of referral service essentially amounts to fee splitting with a third party, which is illegal under the current N.Y. State Dental Practice Act. How can other dentists find you online? Zuckerberg: The office Web site is www.painlessdrz.com, our Facebook site is www.facebook.com/painlessdrz and our Twitter handle is @painlessdrz. “We have been using the E4D since December 2009 and are finding more and more cases to do with it every day. The high-tech design also reinforces my reputation of being the “Inspector Gadget” dentist. I find my patients rely on my being cutting edge to provide them with the latest technology to deliver the highest quality care. I have now treated several generations of families and they have seen me be among the first dentists to offer air abrasion cavity preps, digital X-rays, laser cavity detection, fully computerized office featuring paperless technology and now, same-day lab-quality ceramic restorations. The staff of Dr. Zuckerberg’s practice (pictured above from left, back row) Rosa Cavalluzzi, office manager; Michelle Casarella, chairside assistant; Lori Bretts, hygienist; Vanessa Rodriguez, front desk manager; Dr. Lance Gordon, associate; (front row) Dr. Zuckerberg; and Kim Schiavone, chairside assistant.